On August 1, 1998, 32-year-old disillusioned New York attorney Lisa Reisman plans to leave the law and hit the road in a lipstick-red convertible. Instead, she suffers a massive seizure and is found unconscious in her apartment 46 hours later. After undergoing brain surgery at Memorial-Sloan Kettering Hospital, she is diagnosed with a glioblastoma multiforme, the most lethal of brain tumors, and given a prognosis of one year to live. In the midst of six weeks of daily radiation and six rounds of chemotherapy at Yale-New Haven Hospital, Reisman gradually works to recreate her daily life. Left with no hair and a severely weakened immune system, she overhauls her diet, memorizes poetry, and engages in a strict exercise regimen to combat the ever-present fear of dying and death. Five months later, she undergoes an MRI that shows the cancer has not spread. While follow-up MRIs will continue indefinitely, her doctors show optimism that she is in the clear. Through the next ten years, Reisman faces what seems an even more daunting challenge: how to make a life equal to her miraculous recovery. Determined to forge an identity separate from one of survivor, she spends years riding on a series of successes and failures—as a writer, in dead-end jobs, and in a string of short-term relationships. 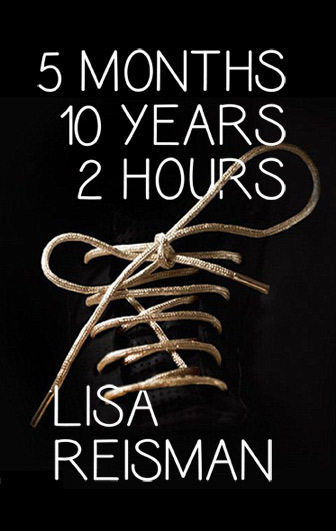 During the two hours of a grueling triathlon to mark her ten-year anniversary of surviving the disease, Reisman realizes she’s already found what she’s been looking for: her family and friends on the sidelines and her work crafting stories for a small newspaper about the unsung townspeople, merchants, and stars of stage, print, and screen peopling her tiny corner of the world that lend her existence meaning and worth.